Last summer a friend heaped scorn on my garlic plants. Although I vow to remember the good and forget the rest, his garlic-scented derision lingers a bit. Like many people, he cuts garlic scapes right away. This is a common practice. 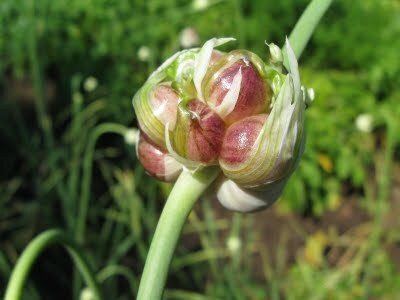 Hard neck garlic varieties hoist up a flower stalk generally referred to as a “garlic scape” and it’s believed the plant will form larger garlic bulbs when the scape is cut. I do cut scapes to use in cooking but I have four rows of garlic and not enough use for all those scapes. I also assume the plants know what they’re doing. So I let many of those scapes continue growing. They curl into aesthically pleasing twists while developing a head called a bulbils. It’s made up of feisty little kernel shapes. These too can be harvested and used. They puff up as they roast in olive oil or bake in a sauce, producing a delightfully fresh garlic flavor. 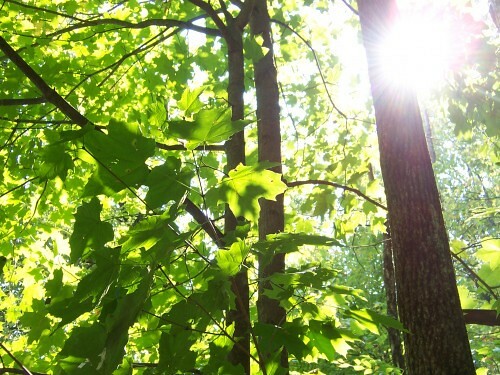 I find I use them more eagerly than the green scapes. Still I have some bulbils left on the plants, hardening in the summer heat. That’s okay. 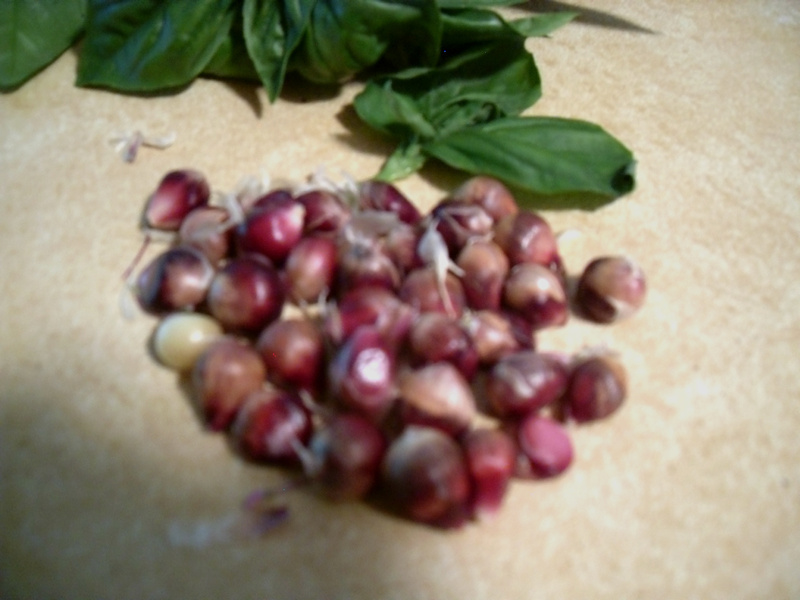 They can be left on the plant and used as garlic seeds. I normally plant garlic in October. I tend to use the cloves that I’ve damaged while digging them up to replant for the next year’s crop. But what if the garlic crop has been ruined by rot brought on by heavy rains? (Remember rain?) 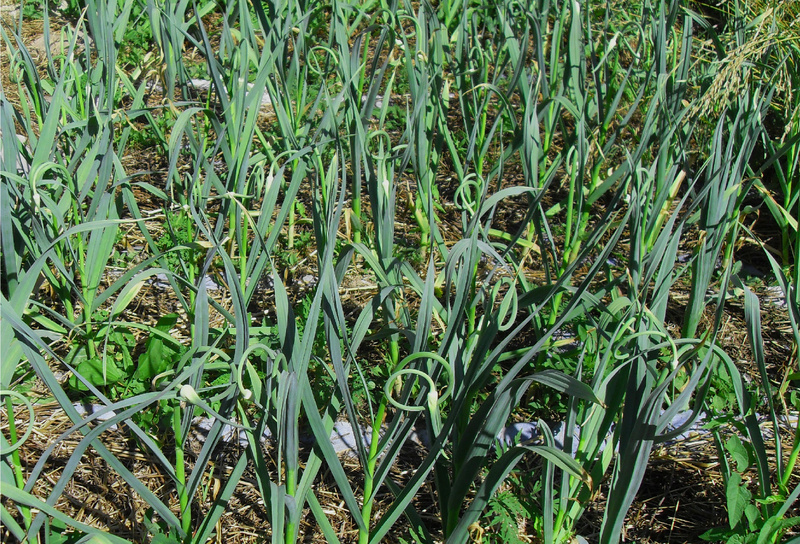 Leaving at least a few garlic plants to mature into bulbils heads can save the home gardener the costs of replacing organic garlic, although the first year’s crop will not be as productive. I also like to have enough stalk left on garlic plants to guide me where to dig. The stalk, once a scape, is also useful to tie garlic up to dry a bit before storing. To each his or her own garlic-scented opinions. I’m a scape harvester and bulbils harvester but mostly a slacker gardener. I’m glad I can trust nature to provide me with decent excuses for letting plants do their thing. This entry was posted in gardening, laziness and tagged gardening, garlic, laziness. Bookmark the permalink. I agree with your justifications for growing some bulbils, but I would like to know something. Have you noticed the size difference between the bulbs that grow on the plants with cut scapes versus uncut? That’s an excellent question, probably best answered by a more organized gardener. I keep vowing to keep track of what varieties I planted where, timing, harvests, and so on but those remain good intentions only. By the time I dig up all our garlic I’m just in work mode, trying to keep from stabbing them. I suspect cutting the scapes may add a bit more growth to the bulbs, letting it go to bulbils would hamper the bulb. I’ll try to pay closer attention this year. Even if the bulb is smaller it’s worth it to me, I think the flavor of the bulbils is wonderful. First, Thanks, Laura, for the link to my website! I’ve been experimenting with NOT cutting the scapes – and it’s a complicated question, because every year varies so much, the varieties are different, and even within a plot, there can be differences. What I’ve noticed is that the plants on which I cut the scapes seem to mature earlier – maybe because they are a little panic stricken with having their heads cut off and so put all their energy into the bulb. If a gardener cuts most of the scapes and then harvests when he/she thinks they’re ready – meaning harvests ALL the plants, not just the ones with the cut scapes – then the ones with the scapes left on, which I am finding take a little longer to mature, will often be smaller. In my experience, though, with the right soil and weather conditions, NOT cutting the scapes and letting the plants take their time in growing to maturity results in bulbs that are every bit as big as their cut-off companions (sometimes larger) – and I would even argue that they are more flavorful and last longer on the shelf. PLUS – like you say – you also get the little bulbils, which can be used in so many different ways and also planted. I vote for cutting only those to satisfy your spring craving for garlic. I planted my garlic last fall and its come up all great guns this spring. When should I expect to see scapes? Even the garlic greens can be eaten, sparingly, if you want to add some to a stir fry. Those lovely curving scapes usually appear when the plants are over 2 feet tall. Thanks for the input! I love onions and all the onion family so I am hoping for some homegrown! I checked today and the scapes (now that I’ve identified them) are between 3″ to a single 8 ” with a little bulbil 🙂 I’m so entirely tickled!